We always start with a business meeting, followed by Show-&-Tell and then a program. For many, Show-&-Tell is a big favorite. It gives everyone a chance to share what they've been doing and it is always inspirational. For some reason, there were a lot of double weave projects shown. 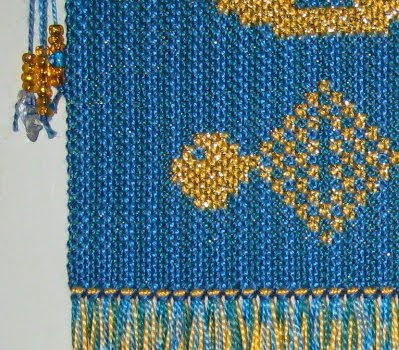 I've been thinking a lot about double weave lately, having taken a class on it a long time ago. It just seems to be drawing me to a self-study this winter. Then Bobbie Kelsten showed us her double weave pick-up pieces; Hamsa Houseblessing wallhangings which she had recently completed. Bobbie's work is gorgeous, and she sells it at the North Carolina Arboretum gift shop. She was also recently juried into the Southern Highlands Craft Guild. Anyway, I was absolutely drooling over those pieces and thinking how much I really wanted one. Then she said, "...and I want to give one of these to Leigh for her studio, for everything she has done for the Guild." I couldn't believe my ears! It's approximately 6.5 by 17 inches, including fringe. Bobbie, thank you! It will always have a place of honor in my studio. I feel very blessed indeed. Doubleweave is really cool anyway. But this gift is just amazing. I love the blessing that goes with it too! What a beautiful and well deserved gift!!!! The blessing is so touching!!! Oh you so deserve this - wonderful all the way around. 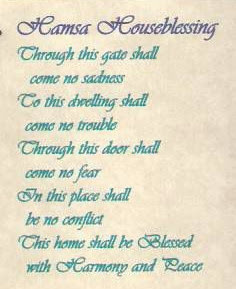 that's a really nice surprise - and the "sheltering hand" is a very fitting motive for a house blessing like that! my friend Linda recently took a double weave class and is totally taken with pick up. I don't know what any of you are talking about, but hope to. Oh wow, that is beautiful! What a special gift and remembrance of your friends from your guild. T.
How special and kind to have a blessing like that. And may wandering and lost family always find their way home. Just lovely Leigh, what a wonderful gift and blessing all rolled into a spectacular woven piece. I'll bet you can hardly wait to get your studio back and put that up. I am speechless......as I suspect you were as well! That's absolutely stunning. I'm sure you deserve it, but what a lucky lady you are! And perfect for your new room!